The mission of the United Methodist Church and our mission at Elk River United Methodist Church is to make disciples of Jesus Christ for the transformation of the world by proclaiming the good news of God’s grace by exemplifying Jesus’ command to love God and neighbor. You are invited to worship, learn, serve and enjoy fellowship; we welcome all! Kids's craft, music practice, confirmation, and men's or women's Bible studies are all available after dinner. 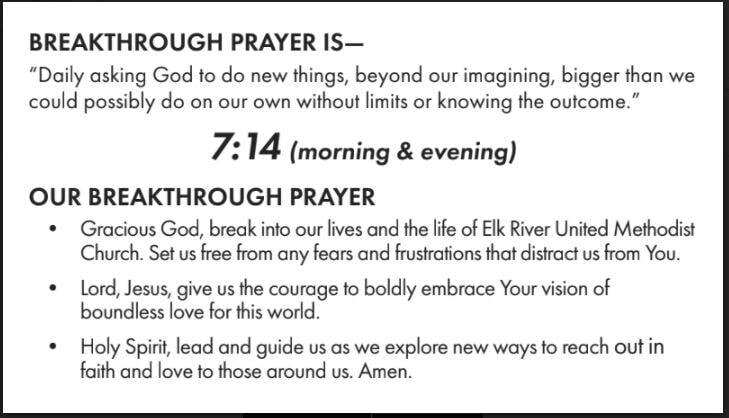 We invite you to join in our Break Through Prayer at 7:14 AM an d PM each day.